Welcome to Red Couch Recipes! When I used to live closer to my sister Jacqueline at Purple Chocolat Home, we used to hold Martha Stewart Days. One of the cakes we used to make was this Harvest Cake. It combines my love of chocolate and marzipan. 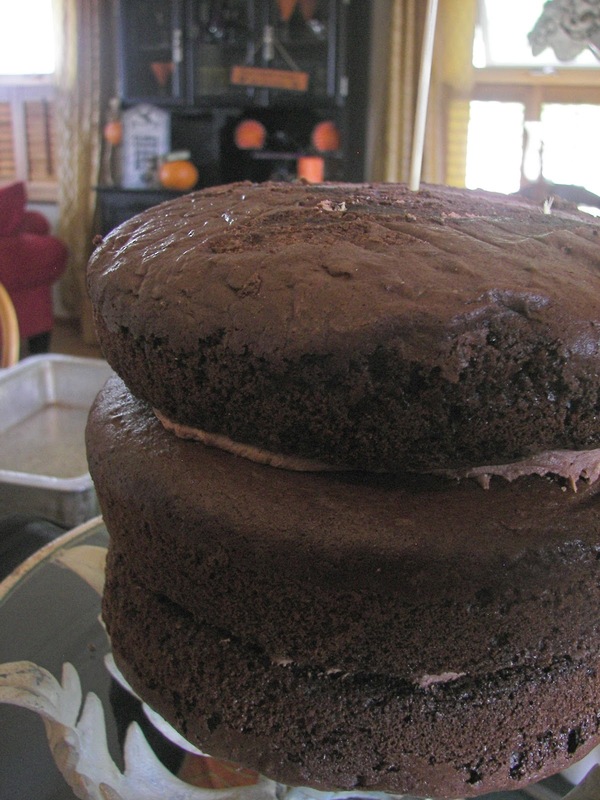 This year, Jacqueline and I met at my home and made the Chocolate Cake. 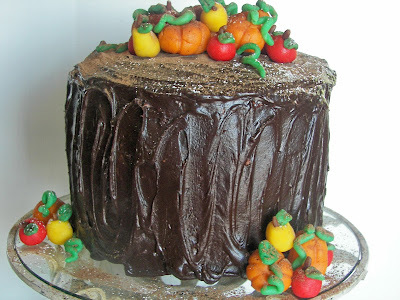 We are both posting it today; so if you have looked at the cake at Jacqueline's site, this will be a repeat. We made one cake, but we are both posting it; we took separate photos. I was the fortunate cake keeper and it was so delicious. I gifted a few friends with a large wedge and some marzipan fruits on the side. My love of marzipan came when as a young girl my mother and I would visit the Swiss Colony Store at the Hilldale Mall in Madison, Wisconsin. There you could find individual wrapped pieces of fruit or vegetable-shaped marzipan for sale. My mother would indulge me in this treat from time to time. As a young girl, I even tried my hand at making home made marzipan -- not with a lot of success back then. 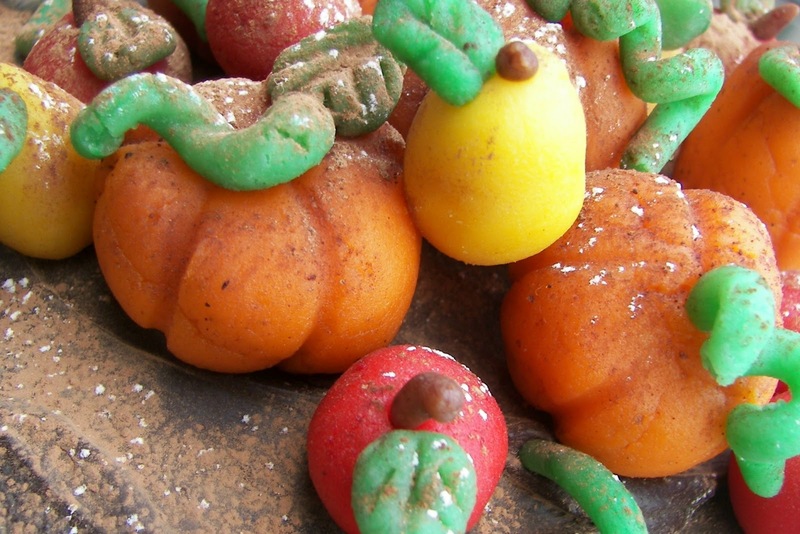 Store bought marzipan IS really easy and fun to work with. So when I saw this cake on the Women's Day cover in 2002, I knew we had to make it! 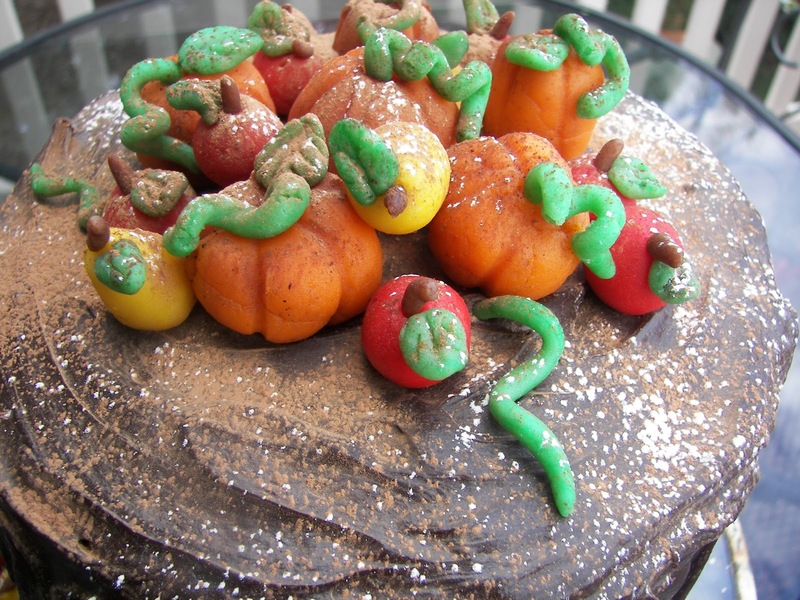 One thing we forgot to add this year are chocolate leaves -- maybe next year I will remember. 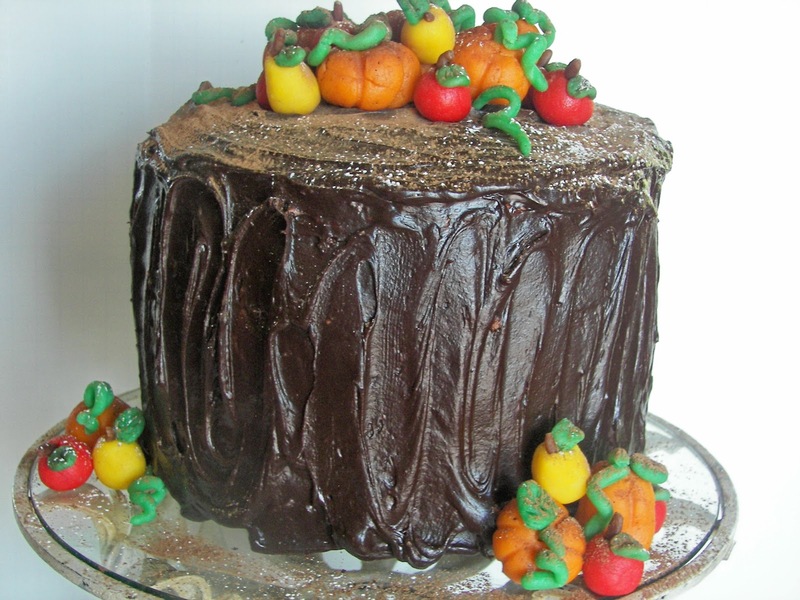 I make this cake almost every year in November. Last year my daughter sand I made it together; they loved shaping the marzipan -- a fun activity for kids. I usually only make a two -layered cake, but Jacqueline, the Queen of Cakes, knows how to make "Showstopper Cakes" -- so we made a three layer cake. I agree with Jacqueline -- the third layer really makes the cake spectacular. See her "Showstopper Cake Tips" below. I actually was lazy and just copied her instructions for this post, with a few edits. Thanks Jacqueline. 1 recipe Chocolate Butter Cream -- See below for recipe. 1 recipe Chocolate Ganache -- See below for recipe. 2- 7 ounce tubes Marzipan -- Jacqueline says to squeeze the prepared marzipan tube to see if it is fresh. The tube comes in a box -- you can squeeze the tube through the box. This is good advice. 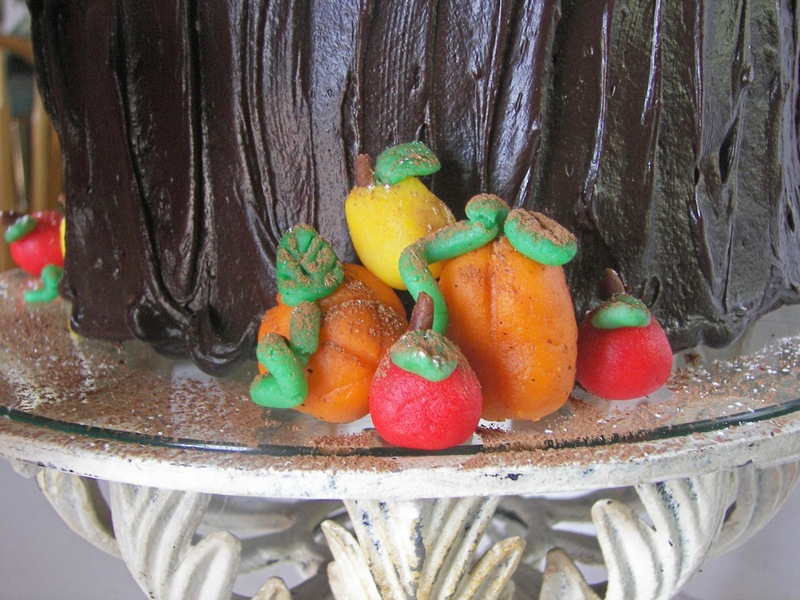 If you buy hard marzipan, you can not really form the fruits for your cake. Because marzipan is expensive, you could get by with one tube. Cocoa Powder and Powdered Sugar -- this helps to soften the colors. On desired cake plate, put a few tablespoons buttercream to anchor the cake. Lay one cake, top side down, cover with a thick layer of buttercream, stopping 1/2 inch away from edge. Top with second layer, bottom side down, cover with buttercream. (Trim the top of this layer if necessary to make it level.) Top with final layer, bottom side down. 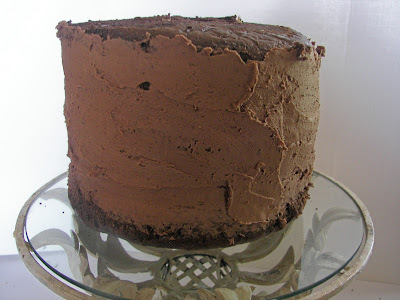 Cover with chocolate buttercream, making it smooth. Frost with chocolate ganache. The cake with it's crumb coating on. Heat the cream just until bubbles form around the edge. Place the chips in a bowl and pour the cream over the chips. Stir until melted. Continue to stir until it is the consistency of frosting. add detail. Curl the vines around toothpicks. Jacqueline's Tips for A Showstopper Cake! 1. Make 3 layers of cake (1 1/2 recipes so it is tall). Really bigger is always better if you want a standout cake! 2. Line bottom of pan only with parchment and don't grease the sides of the cake pan. This lets the cake rise evenly. Bake cakes and cool for 10 minutes. When cool, run knife around pad edge to help release the cake from the pan. Turn cakes out on cooling rack. 3. Wait until cake is cooled to frost!!! In fact, it would be better to freeze the cake for a bit before you frost and fill. 4. Make sure frosting and filling are soft enough to spread. If your cake starts to fall apart as you spread the frosting, stop and add a little more liquid, only 1/2 tablespoon at a time. 5. Spread filling to within 1/2 inch of the edge, otherwise it will squeeze out. 6. Use 3-4 bamboo skewers to hold all 3 layers together, cutting so that they don't show above the top layer. 7. Cover cake with a crumb coat using a flat metal spatula. bit so when you frost the top you have a lip to meet up with. 9. When you have covered it with frosting, use the back of a spoon to add the desired texture and swirls. As I told Jacqueline..."Martha Stewart Days" sounds like a lot of fun! I really am going to attempt one of these showstopper cakes! It's beautiful! Wow! That would be a memorable cake! Your food is so beautiful! And could I please come if you have Martha Stewart Days! Oops, did we use 2 tubes? I will have to go back and correct that! Love your story about Hilldale. I didn't know that, but now that you mention it, I remember Mom loved Marzipan fruits. Glad you just copied my instructions, I kept checking to see if you had posted to see what you were going to say!! Love the new Thanksgiving background. It is so classy and gorgeous. Lets get together again to cook.Love you! Happy November! I love what you've been up to. This cake is a work of art and I hope you have an upcoming tablescape featuring it as your centerpiece. I appreciate all of your talents! What a wonderful activity to share with a sister ;) It really is a showstopper. I loved it when I first saw it at Jacqueline's blog! oh yum, what a divine looking cake. Worth skippin' supper for if you ask me! Why am I always hungry when I read these posts! My mouth is watering now! Thanks SO much for linking up to Thrilling Thursday @ Paisley Passions. Hope to see you again soon. Hi! I'm visiting from the T&J weekend wrapup party. This is great looking cake! Thanks for sharing the showstopper cake tips too. It is juts beautiful! That cake is a showstopper....it look like one (juts in height) we get at a restaurant. 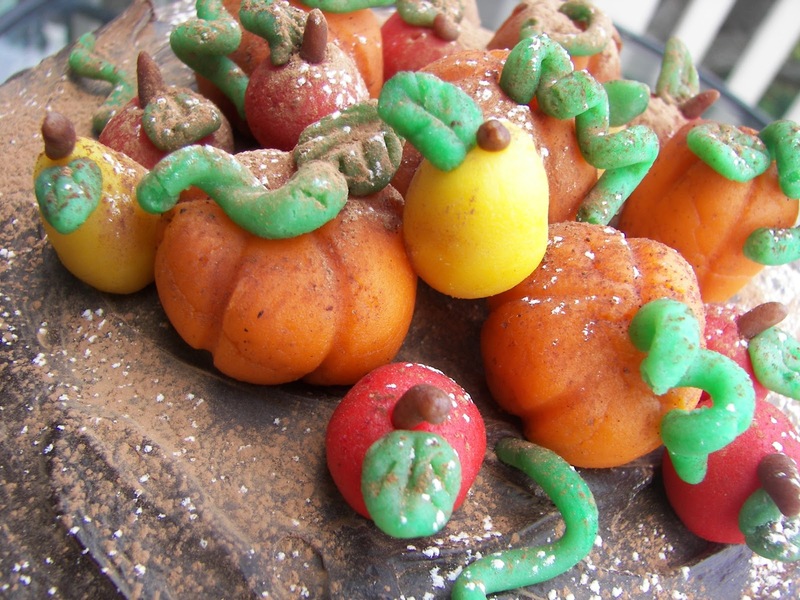 The marzipan pumpkins are fabulous too.